Sheila Applegate opperates globally out of Syracuse New York. She provides Life Coaching. 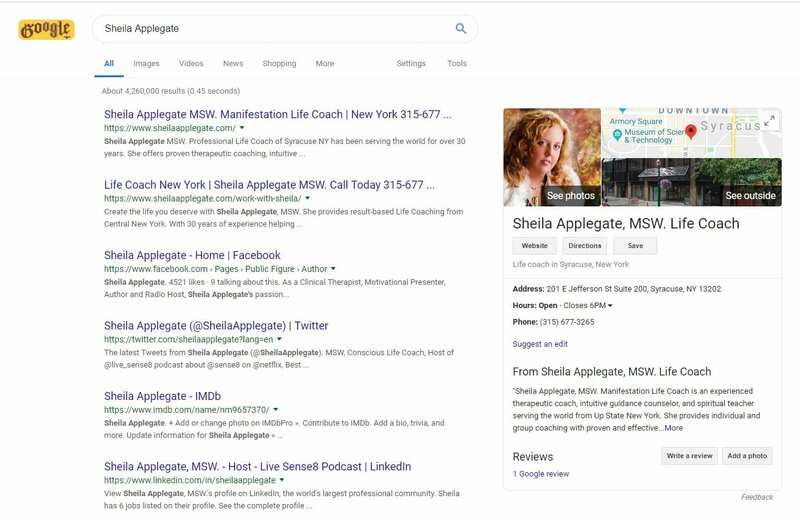 Sheila Applegate was seeking out a seasoned web design and Internet marketing firm. for a new visual image that reflect her brand message and the services she provides. One of the challenges here was to create a look and feel that balanced the male and female attributes, was elegant, and approachable. Our solutions was a neutral with a pop color pallet, balanced fonts, and nature. All of these reflect our impression of Sheila and her work which is, according to Zac, “Creative, Brilliant, & Zen”. 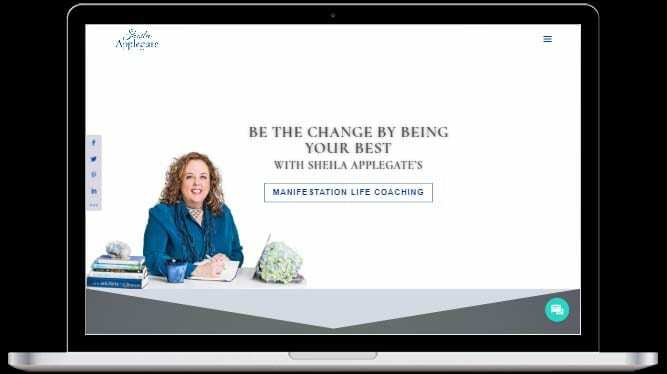 I am Sheila Applegate, MSW., Manifestation Life Coach, Best Selling Author and Award-Winning Meditation Teacher. I help people Manifest their deepest desires. After a twenty-year career as a Spiritual Reader, Healer and Teacher I was ready to support people on a new level. My challenge was to create a website that reflected my new services while honoring my years of expertise. Having developed my career primarily by word of mouth, I wanted a website that would attract new clients while giving them an opportunity to experience my work and get to know me through the site. 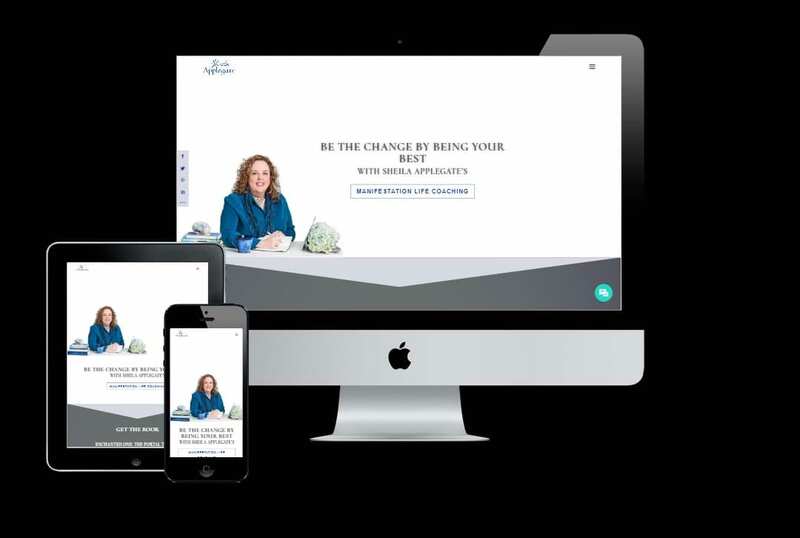 Having worked with Intuitive Edge Design previously, I knew they would walk me through every step and help me create the perfect web platform for me business. Not knowing exactly what I needed to create the effect that I wanted, it was important to me that Intuitive Edge Design evaluate and advise me on the best use of my time and money when investing in this project. That is exactly what they did. Intuitive Edge Design is affordable, honest and they know how to get the job done. I now have a website that reflects my current services. My previous clients have a better understanding of how I can take them to their next level. I am getting new clients and opportunities on a regular basis.